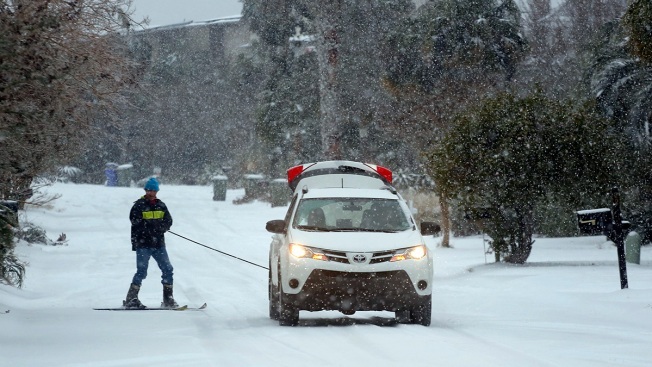 Sid Rismani skis behind a car on Waterway Blvd. while heavy snow comes down on the Isle of Palms, S.C., Jan. 3, 2018. Storm intensity is measured by central pressure - the lower the pressure, the stronger. A storm is considered a "bomb" when the pressure drops rapidly - at least 24 millibars in 24 hours. So far, the storm has dumped freak snow on the Southeast. It's aiming for the Northeast, where the snow forecast for Thursday isn't that big a deal, Furtado and others said. The worst of this storm will stay out to sea. What is going to be bigger is the high winds - gusts exceeding 60 mph - and the bitter cold that follows, they said.